For the second time in little over a week, a pod of orcas has cruised through Victoria's Inner Harbour. Whale watching captain Jackie Cowan says the pod of transient killer whales – which prey on seals and sea lions – was following the incoming tide. She said the tide had been very low and was sweeping back into the harbour, carrying nutrients that whales know will attract seals. Cowan says the pod only spent about half an hour in the harbour before moving on. 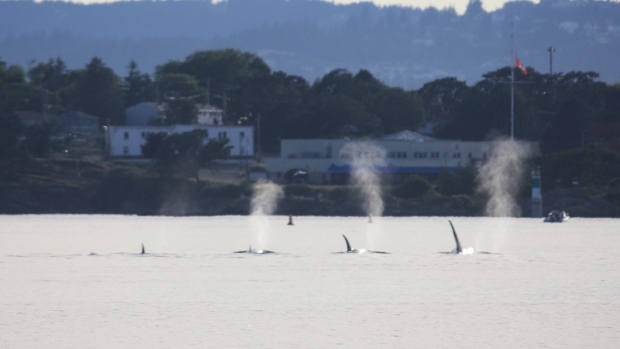 A different pod of transient orcas toured Victoria's harbour, including the inner and upper harbours, for about an hour on June 7. It was the first time whales had been seen that far into the harbour in many years.